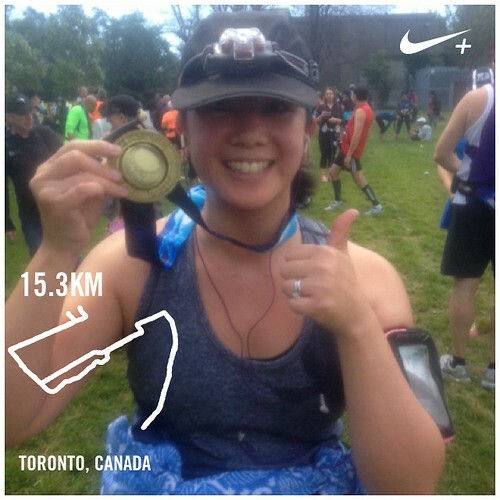 In August I ran A Midsummer Night’s Run 15k race. I knew that the race would be challenging because I unexpectedly took three weeks off from running. In fact, this year I’ve been finding it very challenging to run consistently or even at all. Part of it has to do with not being part of a running group (I also moved office buildings and am no longer close to my old Running Room). Another part of it has to do with the fact that many of my running friends have been injured so I don’t have as many people to run with or help keep me motivated. Despite that, I’m still chugging along. The race shirt. It’s long sleeved and beautiful. More importantly, it’s super comfortable! 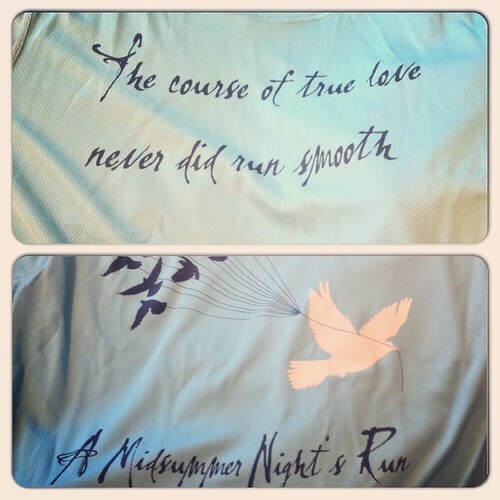 As the name implies, A Midsummer Night’s Run is an evening/night race. They have three distances to choose from, 5k, 15k and 30k. Being ambitious, I had initially thought about signing up for the 30k but Dan (thankfully) talked me out of it. Knowing that we had our three week trip in Italy in June, he knew that I wouldn’t be able to put in the training necessary to run 30k. I was really grateful for this because, as I mentioned earlier, I also didn’t end up running for three weeks prior to the race. I’ve heard many good things about the race and also wanted to do it because it was close to where I live and runs through one of my favourite parks, Tommy Thompson Park (also known as the Leslieville Spit). 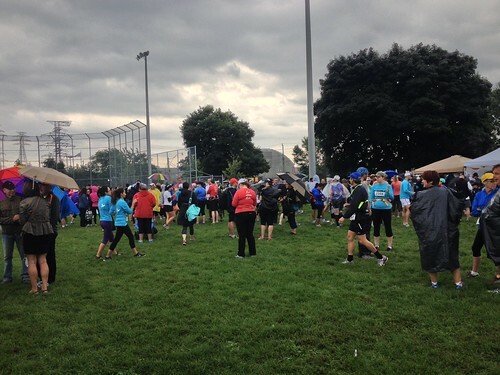 Last year they had to move the course to the Toronto Island due to construction, so many people were happy to see it return to its original route. I took some pictures in the start area. Lots of people also anticipating rain with their umbrellas, long sleeves and garbage bag ponchos. I was nervous going into the race because it poured rain all afternoon. Under usual circumstances I don’t mind running in the rain, but the idea of trudging through a torrential storm with my lack of training wasn’t appealing at all. I checked the weather and it said they were expecting thunderstorms between 6-8 p.m. Those were the exact hours when I would be running! I kept asking Dan if I should go to the race and he kept saying no. Despite that, I decided to get ready and go to the race site to see if the race would be cancelled due to the weather. If it wasn’t cancelled, then it was a sign that I should power through and run it. I didn’t run with my camera so I don’t have any pictures of the course. Thankfully the rain held off. 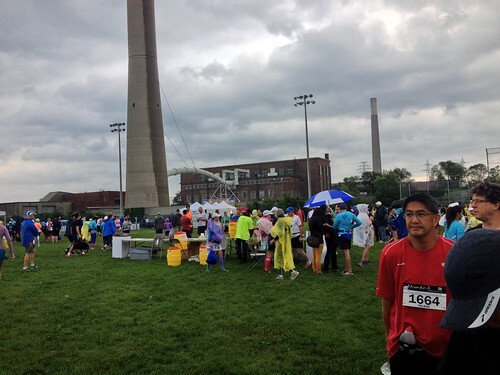 As I was waiting at the start I realized that I was overdressed (I had worn my rain jacket just in case). My plan was to run at an easy pace and treat the race like a training run. As usual I started too fast. There’s something about the anticipation and the crowds that always makes me start too fast at races. I felt pretty good for the first few kilometres as we made our way to Cherry Beach, another path that I run on often. I felt pretty good through Cherry Beach but had to take my jacket off and tie it around my waist. The first 5k flew by, and though I wasn’t at the speed that I would have been last year, I still felt pretty good. Things started to fall apart for me after 5k. I remember being in Tommy Thompson Park and starting to feel sick. I thought for a moment that I was going to throw up but managed to hold it together. I think it was because of the time of the race and my odd eating that day. Strangely, because I was feeling sick I didn’t want to drink any more water or Gatorade (the thought of it was making me feel sick). The middle kilometres of this race were really challenging. I started to feel better again when we exited Tommy Thompson Park and started heading back. After 10k I was feeling back to my old self again but had to stop and stretch at around 12k. I think because I didn’t drink as much water, and it was humid from the earlier rain fall, I was more prone to cramping than usual. My right leg felt terrible and it’s been a long time since I’ve cramped this badly in a race or even a training run. I managed to keep going. When we hit the last turn I had to stop and walk again because my leg cramped up, but as I approached the finish line I managed to run/hobble across it. Even though my time was about 20-30 minutes slower than what it would have been if I had trained, I actually felt great. I was happy that I had hung on and finished the race. They also gave out free stainless steel waterbottles at the finish (I’m still using mine every day now) and the medals were amazing. This is one of the best race medals that I’ve ever received! I love the spinning middle. With my race medal and my headlamp (which I didn’t need). Happy and excited to be done! 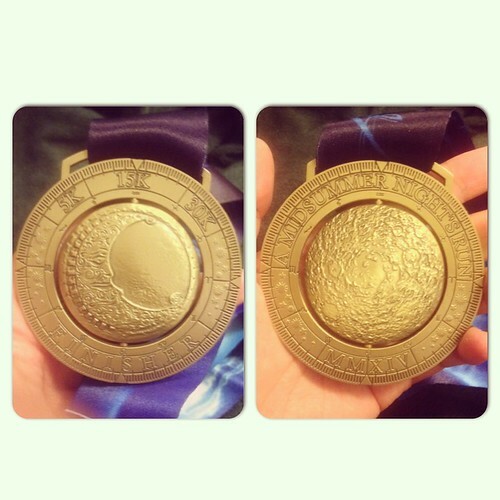 Last look at the race medal. The middle spins!